Another new item that I listed on Webstore recently. The hoop is 3-inches and it’s wrapped in turquoise and dark brown leather lace. White webbing with a silver feather charm in the center. 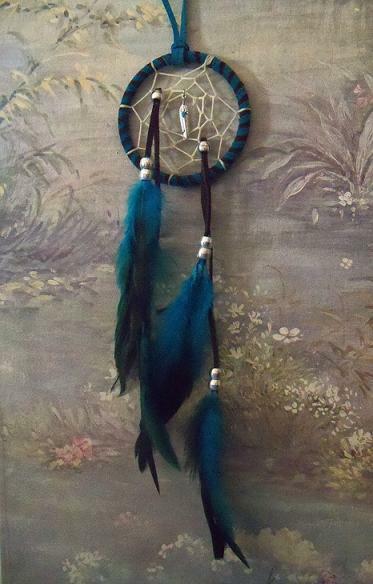 It has blue and black feathers with silver beads. I finished my new Dreamcatcher necklace a few weeks ago. I’m sorry it has taken me so long to post pictures. I’ve been busy with other things and just didn’t have the time to take any pictures until recently. I made this necklace differently than I usually do. It took longer to make, but I love how it turned out. I used two different colors of leather for the hoop and the necklace. 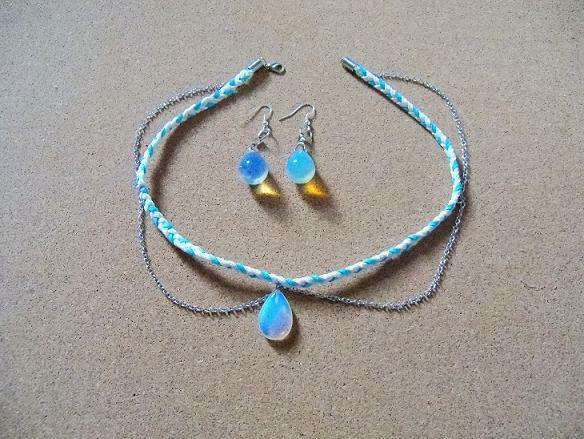 And I braided the leather for the necklace. On the web, I put the Dragon holding the crystal. The stone is real and it is opal. You can see a better picture of the stone here. I really love the crystal. 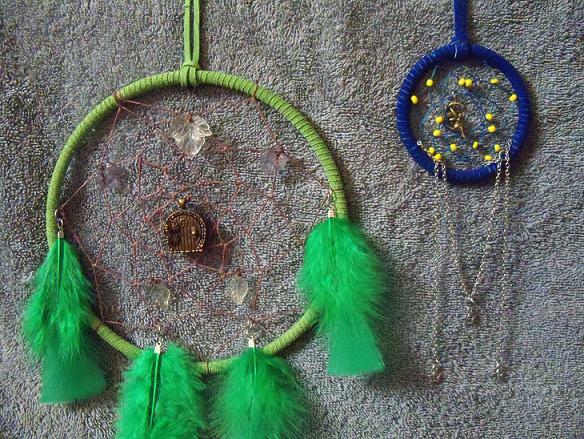 I’m thinking of buying a few more either to make necklaces or a Dreamcatcher to sell on my online store. 2-inch wrapped in soft, orange leather lace, black webbing with an orange gemstone in the center and light brown feathers with black and orange beads. These are my newest Dreamcatchers. And they are being sold as a set. 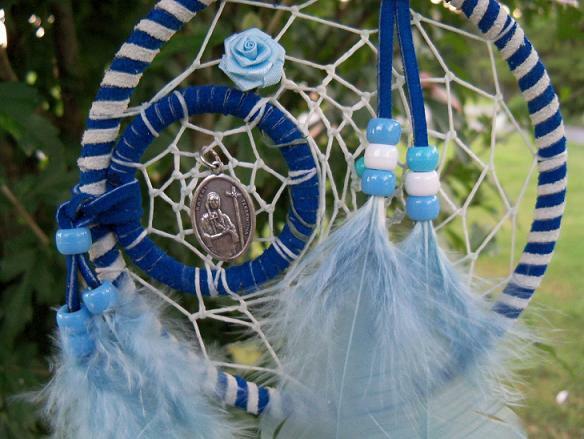 The large Dreamcatcher is a 7-inch hoop. The hoop is wrapped in green leather lace, green feathers on the hoop, brown webbing with leaf beads and dark brown leather lace with brown feather hang from the bottom. In the center of the hoop is a fairy door. It opens and you can write wishes on a piece of paper and put them in there. The small hoop is 3-inches and wrapped in dark blue leather lace. The web is blue with yellow glass beads. From the bottom hangs a chain which has a star charm on each side. In the center of the web is a fairy sitting on the moon. 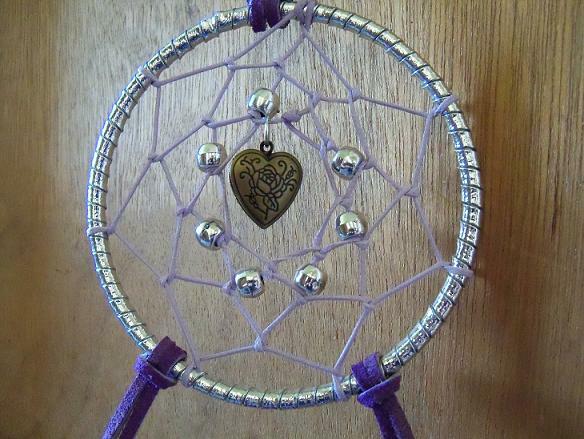 The large Dreamcatcher is meant to represent a tree. The green would be its leaves, the brown its trunk and the branches where the fairy door rests. 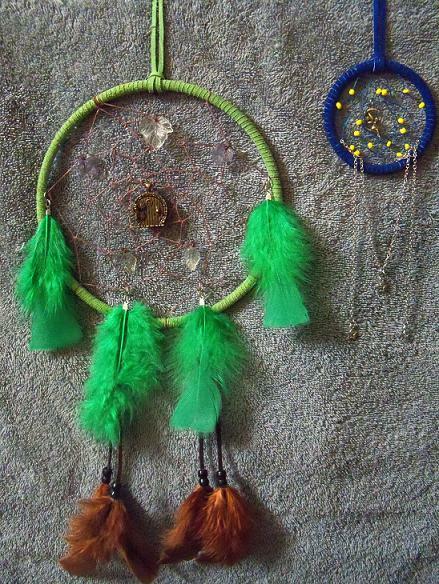 The small Dreamcatcher represents a night sky. The other day there was something I really wanted to blog about, but I have completely forgotten what it was. I have to admit, I have been a little forgetful lately. It’s been happening some this year, but I think it is just the stress of all that’s happened. Since I can’t remember what exactly I wanted to blog about, I’ll just update you all on what’s going on. My dad is doing better. He had surgery on his arm last month. He had a growth on his arm (not sure what it is actually called, but I’ll just call it a growth) and the doctor was able to completely remove it. His arm is still healing, but it feels a lot better. I have also been trying to get more followers on my blog and on Twitter. I am trying to find ways to make more money and I know there are a lot of opportunities online to make good money. There are plenty of people who make their whole income from doing things online and that is what I would like to do. I know you can make money through your own blog and Twitter. I have no idea what I am doing, but I’m learning as I go. I want to have affiliates on my blog, which would be I’d post or have links for different websites and whoever clicks or buys, I would get some money for that. There are other things I’m looking into, but require you to know good punctuation, which I have been working on. Yesterday I submitted writing to two more places. One was for poetry and the other was a flash fiction contest. On the website I think it said they will announce the winners around the 14th of this month. Also, I am still waiting to hear back from three other places. Whenever I know anything, I will post here. And I haven’t forgotten about Positivity Week. I have to come up with topics for the last two days and then I’ll write a post about it. Usually I have it ready to go before November, but this year has been really rough for me and there have been a lot of times it has been hard for me to stay positive. I have been feeling more positive lately and I am looking forward to Positivity Week. I will try to finish it soon and hopefully post it this week. 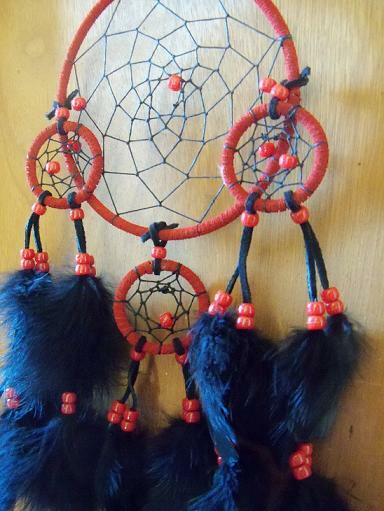 I’ve also been working on a new Dreamcatcher, which will be posted once I’ve finished it. I hope all of you have been well and I am sorry I haven’t been around much. With all that I have been doing, it’s hard to have time to blog. I will try to be on here a bit more though. A friend of my mom’s goes hunting and he had some deer antlers. He wanted me to put webbing on them and some feathers. This is my first time using antlers to make Dreamcatchers, but I think it turned out good.